The Dark Reptilian Shipsets mod adds 12 new, dark Reptilian ship appearance types to the game, each equipped with appropriately color coordinated engines, lights, and forcefields. These new ship appearances will only be useable by the player. The only way to get the AI to use them is to create a custom empire with one of these 12 ship appearance types selected and adding said empire into your new game via the Phoenix looking symbol next to that empire in the empire creation screen. The 12 colors available with this mod are seen in the image right above this paragraph. NOTE: This mod is only meant to introduce a new graphical culture for shipsets. This mod doesn’t support any other form of culture addon (like city sets, species appearances, etc), and those that come with this mod are NOT meant to be used. DO NOT select them. This is a vanilla issue I cannot fix. Pretend they don’t exist and choose another option. The “pureness” of each color is dependent upon the star and system lighting of the system you are currently in. Each effects each ship color differently. If you start with a blue shipset in a red star system, it will look more purple, if you start in a blue system with red shipsets, then it will again look a bit off. This is not ugly by any means, but you will notice the different in color for most of these shipsets when you go from a red-base to blue-based system and vice versa. I cannot fix this without royally screwing up the game’s lighting system, which I don’t think should be done anyway. Update for color-coordinated habitats in progress. Please be patient as a take the time to properly recolor the new habitat diffuse. Thanks. While it’s technically not a required mod, it is very highly recommended that you use Antharis’ Stellar Trails Disabler mod in conjuction with this mod. The Disabler mod removes the blue “streak” behind ships whenever they move. This looks particularly strange behind all but the blue-based Dark Reptilian variations, and thus the need for the mod. Stellar Trails Disabler mod works with the latest patch. Ignore outdated version warnings! Or you can use Clean Space – No Exhaust Trails by ButtJunkie if you want the same thing that doesn’t throw warnings. Downscaled Ships – by Chondrite is now compatible via the Dark Reptilian Shipsets – Downscaled Ship Patch. (Important:: You will also require the use of the Dark Reptilian Shipsets – Realistic Ships Patch in order to use Realistic Ships properly. Without this, Realistic Ship’s species-based Heavy Dreadnought will not appear for any of these cultures. Please read the patch’s description for important details. NOTICE 1: All the mods supported here may not be compatible with each other, please check each mod page before using them together. 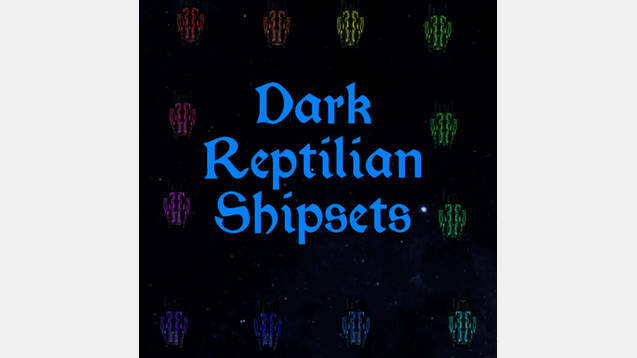 NOTICE 2: Any requests for additional mods to become compatible with this Dark Reptilians Shipset mod will receive due consideration, however, I make zero promises on if the request will be fulfilled. For example, some other ship mods may not be able to become compatible because of a conflict with an already supported mod.